The Rice Masters March Madness meet was held this past weekend. Results can be found here. Jarrod Marrs National Record 40-44 age group 50 Breast 25.02. David Guthrie National Record(s) 55-59 age group 100 Breast 1:00.91 & 50 Breast 27.60. John Wagner (25yo) 19.81 in the 50 free, Jarrod Marrs (40yo) 55.91 in the 100 breast, and Kamila Wlostowska (25yo) 51.60 in the 100 free (The main reason why this is notable is because she beat me by .01). 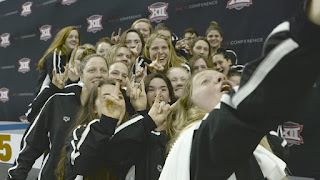 Texas won both the men's and women's Big 12 conference championships. TCU women finished 5th (out of 5 teams), and TCU men finished 3rd (out of 3). Palo Alto Stanford Aquatics came into town and won Sectionals. Notable Texas swimming clubs finishing in the top 5 were: Nitro Swimming 2nd, Cypress Fairbanks Swim Club 4th, and Texas Ford Aquatics in 5th. Full results from that meet can be found here. UIL has realigned the districts and regions in our state to even things out a bit. These changes will go into effect for the next upcoming swimming season (2016-2017). Notable schools moving to 6A are Houston Stratford (2nd place girls 5A 2016, and 3rd place boys 5A 2016) and Austin Vandegrift (5A boys state champs).